I personally think Adam McKay has one of the funniest minds in Hollywood today. The director of Anchorman, Talladega Nights and Step Brothers has an excellent track record when it comes to slightly awkward comedy. McKay's brand of humor really appeals to me. Anchorman is one of the funniest films ever made and the comedic partnership of Will Ferrell and McKay is hard to beat. 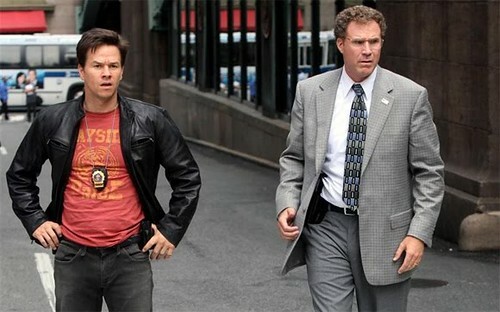 McKay's latest goofball offering is The Other Guys which teams Ferrell with Mark Wahlberg in a standard buddy-cop comedy. The two play paper-pushing detectives that are confined to medial office work until a turn of events thrusts them into the forefront of investigating a large financial fraud scheme. The story is supplemented with supporting turns by Sam Jackson, The Rock, Michael Keaton (who always seems to remind me of Beetlejuice when I see him on-screen) and Eva Mendez help the film chug along and offer up a slew of good laughs. Wahlberg is the big surprise in this movie. He was so god awful in The Happening that I completely forgot about him as an actor. He gives such a wooden and straight laced performance in this movie that is comes off as being hysterical. He delivers his angry yelling lines as if he's reading straight off of cue cards. I don't know if he's doing this on purpose or if he's just so bad of an actor that you can't help but find it funny. A humorous running gag with Keaton's character references lyrics from TLC songs. It's this kind of random humor that McKay seems to bring to his movies that appeals to me. There just didn't seem to be enough consistency with that style of humor in the movie though. The teaming of Ferrell and Wahlberg works well throughout this movie and I found myself wishing the movie focused more on their interaction and less on the terrible plot that involved various money laundering schemes and a group of boring and unimposing crooks. The material is funny overall though and worth watching for some good Anchorman-style laughs, but I would wait for video on this one. At 1:47 in runtime, the movies feels MUCH longer as it drags on towards the end. A very average 3 out of 5 JRs for The Other Guys. Get Him To The Greek remains the funniest movie of 2010 by far. I thought the movie looked good, glad you liked it. And I'm dying to see The Greek. Just saw Hot Tub Time Machine. So funny!